So I know trash cans aren't the most exciting topic, but believe it or not, I bought a really exciting trash can! We were living with a broken kitchen trash can for weeks after the step pedal broke on our old one, so I decided to use a gift certificate I had to CSN Stores to buy a new one. I ended up getting a super exciting motion sensing trash can! I was so excited to receive it that I even raced home from work the day it was supposed to arrive and threw open the box the second I walked in the door! It has an infrared motion sensor (how cool does that sound) and the lid opens and closes automatically if you wave your hand over it! Now I feel like James Bond every time I throw out a piece of trash! Isn't that cool! Needless to say, this is the most exciting trash can I've ever owned! Besides being futuristic, it's also very functional as it holds a lot of trash and the lid seals tightly keeping any yucky trash smells sealed in. Am I going overboard or do you get excited with this type of stuff too? Happy Easter! Today was a beautiful day and we enjoyed a wonderful Easter, I hope you did too. Since I shared some Easter dessert ideas with you last week, I figured I’d show you what I ended up making. First, I started off with carrot cake cupcakes. Yum! I’ve always wanted to make carrot cake and it was pretty easy. Plus, my biceps got a nice workout grating almost 1 pound of carrots! I followed this recipe from BHG and topped the cupcakes off with a simple cream cheese frosting recipe. I’d never made cream cheese frosting before either but it was also pretty simple, just cream cheese, butter, and powdered sugar. I just modified the frosting recipe a bit using less butter and more cream cheese. To make the carrot cake cupcakes a little extra special for Easter, I decorated them with bunny faces using my sister’s bunny cupcakes as an example. Mine aren’t as fancy as hers, but I used what I had on hand and think they came out cute. I used strawberry wafer ears (I had to cut two little openings into the cupcakes to slip the wafers into), M&M eyes, peanut M&M nose, and spaghetti whiskers. In addition to the carrot cake bunny cupcakes, I made an Easter basket shaped fruit salad. This is usually done with a watermelon, but I decided to try my hand at cutting a pineapple into a basket shape. I didn't get the best photo of it, but I think it turned out pretty cute and adds a little fun to a fruit salad. So those are my sweet treats from Easter. How was your holiday? Did you cook up something special? Aren’t they the cutest? I love the wafer ears and cute little jellybean noses. Plus I’ll use any excuse to buy wafer cookies. Update: Since there were some questions about my sister's bunny cupcakes, here's some more info on how they're decorated. She started off with a white frosted cupcake and added (trimmed) strawberry wafers for bunny ears. The eyes are skittles or M&Ms. The nose is a jelly bean with a mini marshmallow on each side and bits of spaghetti as whiskers. The mouth is a chocolate sprinkle and the ones with teeth are rolled out tootsie rolls. How clever! Another Update: I made my own version of my sister's bunny cupcakes. I love that these desserts look so cute, in addition to looking delicious of course! And I'm super impressed that they're all adorned with edible decorations. Because lets face it, if it's on my cupcake I'm going to want to eat it. Have any other fun Easter desserts you can share? And while we're on the subject of Easter, you can also check out my Easter wreath from last year. Update: Check out my 2012 Easter Dessert Ideas for even more desserts. I’ve been waiting all winter for the weather to warm up so garage sale season could begin again! Finally, last weekend the weather was nice enough and I headed out to my first garage sale of the season. I pulled up to the first yard sale and right in the driveway was a beautiful ping pong table for sale. Rob has been wanting a ping pong table, so once I found out it was being sold for a steal I bought it! What? You never bought a spur-of-the-moment ping pong table? Haha, maybe it was a bit spontaneous, but I’m so glad I bought it. Once I got the ping pong table home (with the help of my Dad and his pickup truck), we had to figure out how to get it down into our basement, through our U-shaped stairs. First, we tried the back breaking method of lets just pick it up and carry it down and see what happens. That resulted in us getting the ping pong table stuck halfway down the stairs (also resulted in a sore back- ouch!). Once the old-college try didn’t work, we squeezed the table back upstairs and decided to think through our method a little more. Sure enough, 32 screws later we were able to easily bring the ping pong table down into the basement in three easy (and thankfully much lighter) sections. And since then, there’s been a lot of fun pinging and ponging going on in our basement! I cleaned up our basement a bit, but I’m still looking to refresh the basement and make it more like a game room, especially with our fun new addition. I’m thinking of adding some cool wall art and fabric to make the basement feel a little cozier without the expense of actually finishing it. Any suggestions for the basement? I’m so happy I got such a fun start to garage sale season this year! Have you been to any yard sales yet? 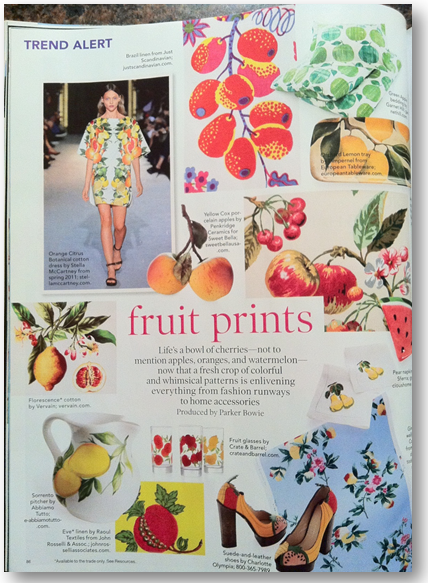 Regardless, I love that they featured fruit prints as a hot trend because I’m in totally on board with them. 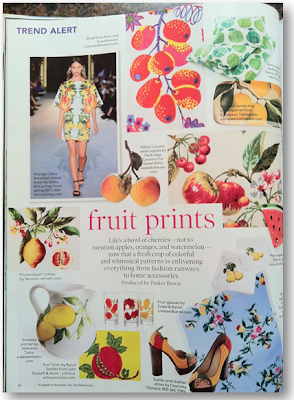 Fruit prints are so colorful and cheerful and I think they’re a perfect accent to spice up a home's décor in Spring and Summer. They leave me smiling and singing like Carmen Miranda! 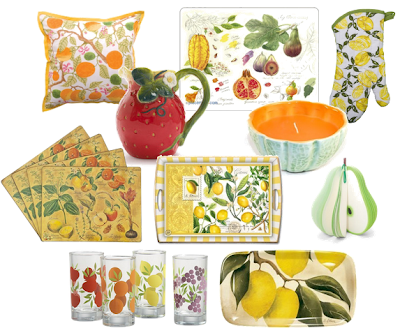 Are you a fan of fruit prints? Oh and if you're keeping track, this is my 7th post where I've made a mention of the Golden Girls! 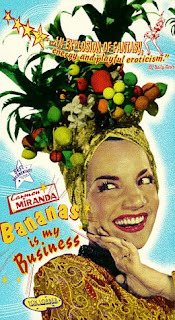 But only my first mention of Carmen Miranda! I’m always browsing real estate listings to find our next house which we dream will have more square feet, more bedrooms, more storage, and just MORE in general. But truth is, our house fits us perfectly for now and probably even has more room than we need. We've even been purposely making an effort to eat in our dining room and hang out in the often neglected living room more often since we typically only spend time in our kitchen and family room. And some people just find big houses excessive and unnecessary. Jay Shafer built himself an 89 square house because he was concerned about the impact of a large home on the environment and because he didn’t want to maintain a lot of unused space. He’s since started a company, Tumbleweed Tiny House Company, to help others build tiny houses too. Of course around the world, many people live in apartments that are small by American standards. One architect in Hong Kong used smart design and moving walls to transform a 330 square foot apartment (which once housed his family of 5 plus a tenant) into 24 rooms. I think these tiny homes are pretty cool and they've inspired me to think about how I use all of my space. Do you have unused rooms in your house? I think these small spaces are pretty cool and I like the "coziness" of them. What do you think? 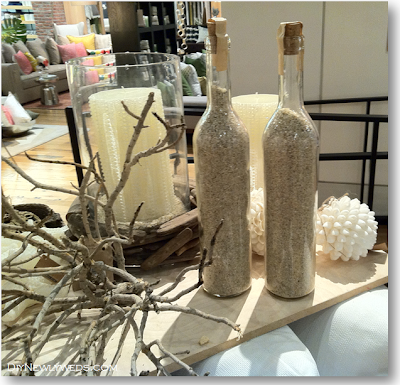 I took a little field trip to West Elm on Friday to check out their new Spring stock. I’ve shopped their website before, but this was my first trip into their stores to check out their stylish goods in person. And of course I loved what I saw! 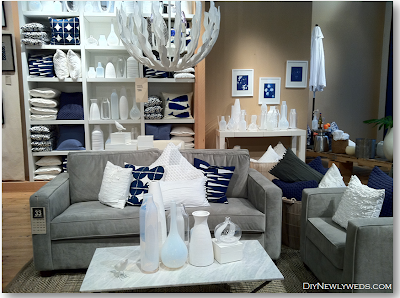 Coming into the store, they had this pretty living “room” set up with all blue and white accents. 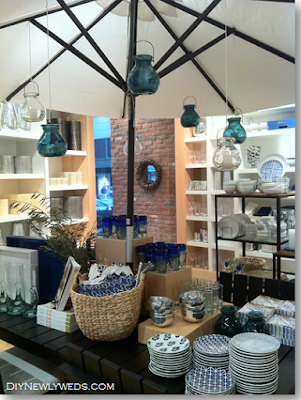 I’ve noticed the blue and white trend a lot this season, including in the new Sabrina Soto collection at Target. I’ll admit I wasn’t crazy about the blue and white trend when I first started to see it, but now I’m really starting to like it. I love anything beach related and West Elm did a great job making this space look serene while adding nautical accents (without making it look like a bad theme restaurant!) I’m even loving the cute whale pillows. There was more blue and white in their patio table display as well. This color scheme paired with the natural baskets made for a sophisticated look. I love the idea of using big baskets outdoors to stash bottled drinks or barbecue supplies. 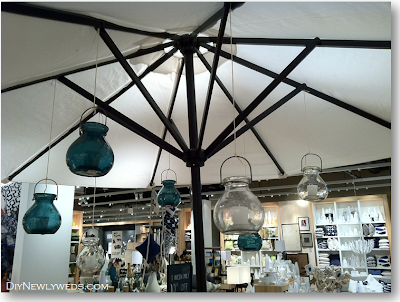 The glass lanterns hanging from the patio umbrella also caught my eye. I bought similar lanterns from the Christmas Tree Shops last year (for under a buck!) and had been wondering if there was a way to attach them to my patio umbrella. These were just attached with string which looks great, but I wonder if this is just for show or if the umbrella can actually be shut with the lanterns attached. I will have to try this once we start dining on our patio again. In addition to all of the pretty decor accents, the store was full of DIY inspiration as well. West Elm has these cute bottles filled with sand which I bet could be cutely recreated at home with an empty wine bottle. 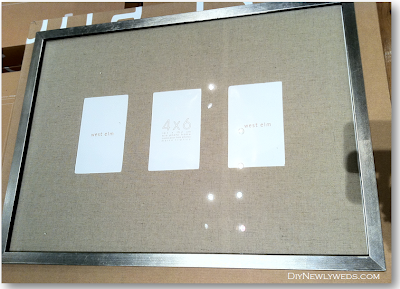 I was also inspired by this frame with natural fabric mat. I couldn’t really tell if the mat was made of a type of burlap or some type of linen fabric, but regardless I love this idea. I think I’ll try to recreate this at home with a collage photo frame I have on hand. I was so happy to finally visit West Elm in person. Although I restrained myself and left without any shopping bags, I did leave with plenty of inspiration! Are you a West Elm fan? How do you like this season's popular blue and white color pallet? Since my modernized Golden Girls house was a hit, I decided to make this a regular feature on the blog! Today, I'm putting a modern twist on the Brady Bunch house! I loved watching this show as a kid; the Brady kids were always having fun with wholesome mischief like potato sack races in the yard, dressing up as ghosts to spook potential home buyers, and finding ancient haunted tikis in Hawaii. Here's the happy family lined up on the stairs for a family portrait. In one episode the boys play ball in the house, against Carol's rules, and accidentally break a precious vase on this table. The horse luckily remains intact. Here's Peter and Jan putting on a magic show for the family. Cindy was too scared by the magic to attend. I decided to recreate the Brady Bunch living room to imagine what it would look like if the show took place today. This awesome drawing of their living room provides a good look at all of its 70s charm. And here's my version of an updated and modernized Brady Bunch house. As I was putting this room together, it occurred to me how much of the Brady's furniture is back in style these days! - Brown Sectional: With 6 kids the Bradys need a lot of seating so I chose a sectional rather than a sofa. It's not green and floral but it is a 70s approved chocolate brown with stain resistant fabric to boot. -Canary Print Pillows: The floral print of the sofa had to go, but I kept a fun print with these canary throw pillows. - Green Chair: I had to keep some green furniture, so I chose this Z Gallerie chair which is strikingly similar to the original. -Wood Coffee Table: I choose a mid-century looking coffee table, this time with a shelf for extra storage for the kiddos. -Cube Side Table: It's not a hexagon, but this chunky cube makes for a nice side table with hidden storage. -Silver Lamp: Z Gallerie must have been checking out the Brady bunch house too because this lamp is also strikingly similar to the original. -Striped Curtains: I'm not sure what those curtains in the background of the living room are, but I found some similar horizontal striped ones. -Collage Frame: I couldn't resist adding a collage frame for those smiling family portraits, including Alice of course. -Buffet Table: Z Gallerie came through again with another piece that's very close to the original. I'm seriously starting to wonder if Mike Brady has some ties to the store. -Horse Statue: The room can't be complete without their iconic horse, of course. Another Z Gallerie find! Do you approve of my modernized take on the Brady Bunch living room decor? What shows would you like to see me modernize next? I tend to hold onto clothes for a little too long...okay, way too long. I always like to think that something will come back into style, magically unshrink itself, or that I'll just grow to love it or fit into it someday. But as much as I hate parting with things, the truth is that it's really annoying to have to sift through the extra stuff when I get dressed in the morning and have my closet filled with clothes I don't like. 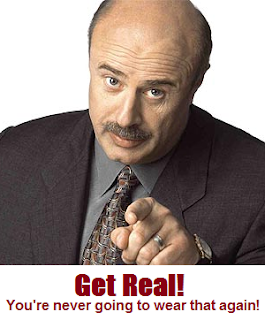 So I decided to finally get real, as Dr. Phil likes to say, and realized that I'm never going to wear this stuff and it's time to get rid of it. Don't let those shopping bags fool you, they were packed with clothing. In fact, 100 articles of clothing! To be fair about 20 items were my husband's, but regardless it's still a lot of stuff to get rid of and it felt great! Almost everything I got rid of went to Goodwill where I received a donation reciept for next year's tax return, but I held onto a few of the nicer things to sell to a consignment shop, on ebay, or possibly a future garage sale. I mainly got rid of cold weather clothing, but I plan to sift through my warm weather clothes soon. Have you purged your closet recently? Any tips you can share? Happy April! I don't want to jinx anything, but it's finally starting to feel a little like Spring around here! But before our April showers bring May flowers, let’s take a look at how March went in like a lion and out like a lamb (those elementary school phrases sure made an impact on me). Bow-Tie Bookmarks from How About Orange. Such fun projects this month! What did you cook up in March, leave a comment with a link to your favorite projects too! P.S. If you've been featured here, feel free to grab a button to display on your site!